It’s not often that you find yourself writing a complimentary letter to thank a builder for a job well done. In that regard, the Einheit Company stands alone. It was so refreshing to finally work with a builder who actually delivers on their promises. From the beginning, Beau laid out a clear and detailed plan as to how things would proceed. We were able to go into the project with confidence that there would be no hidden costs or additional “fees” unless we requested and approved them first. Each week we were informed which contractors were scheduled to show up on each day and show up they did, working side by side regardless of who else was there. My husband and I couldn’t believe the organization and efficiency with which things progressed. I suppose that’s why the project was completed on time, as promised. Even more importantly, was the consideration and attention to detail that made the whole experience much more bearable than we expected. Installing a temporary wall to help keep the dust to a minimum, keeping the worksite (including our driveway) clean and free of debris so it was safe for our kids to play outside and even pressure washing our patio so our kids could swim in the pool without plaster dust, were just a few of the things that the Einheit Company was willing to do to help us maintain some normalcy amongst the chaos of construction. Like many homeowners, we’ve worked with a wide range of builders and contractors on various projects. This is the first complimentary letter I’ve written to any one of them. I think that in itself speaks volumes about the quality of work provided by the Einheit Company. Thank you Beau not only for building us the perfect addition for our growing family but more importantly for delivering on your promises. In early 2006, my husband and I decided we wanted to build our dream home. It was very difficult to decide who we trusted with such a huge project. Luckily, we came across Beau Einheit through a family friend. He spent so much time with us, while our house was just a dream, and helped us make it a reality. One day, we sat on the tailgate of his truck in front of our lot and went over detailed plans as he described the way our home would face the morning sun and the light it would capture in the evening sunset. We were totally impressed with his knowledge and his attention to detail. Einheit Homes turned out to be one of the best decisions that we have ever made. All the way from the pouring of the footers to the end of construction… the detail was never lost. He never missed a day of coming to our job site and making sure that everything was pristine, clean and tidy. There was no question that we couldn’t ask and they always answered immediately…always letting us know exactly what was going on and never making us feel out of the loop. We have referred Einheit Homes to many of our friends and family. If we ever had the opportunity to build again, Einheit Homes would be our first call. …showing us again that you go above and beyond building stunning homes with the highest quality. We appreciate you! I would like to thank you and your entire team…it has been an absolute pleasure to work with you. Your courtesy and workmanship are like no other. I just wanted to drop a little note to say “Thank You” for being pleasant and professional through this whole building process. You made it very easy. I look forward to working with you in the future. 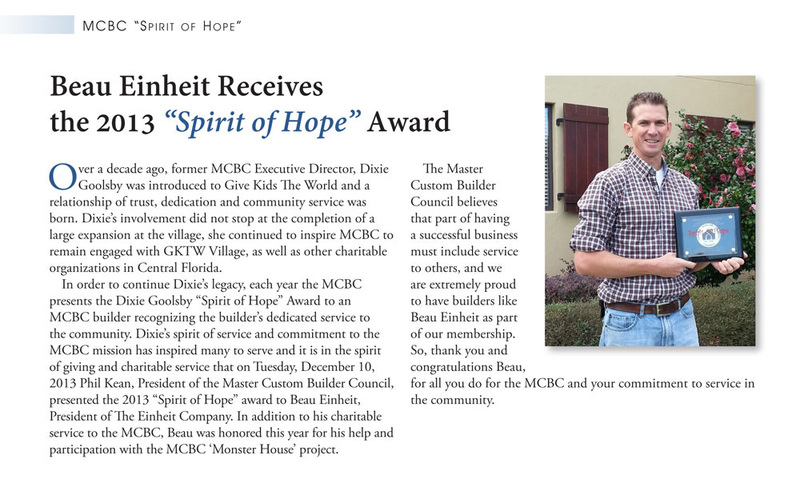 Beau Einheit received the 2013 Spirit of Hope Award from MCBC. 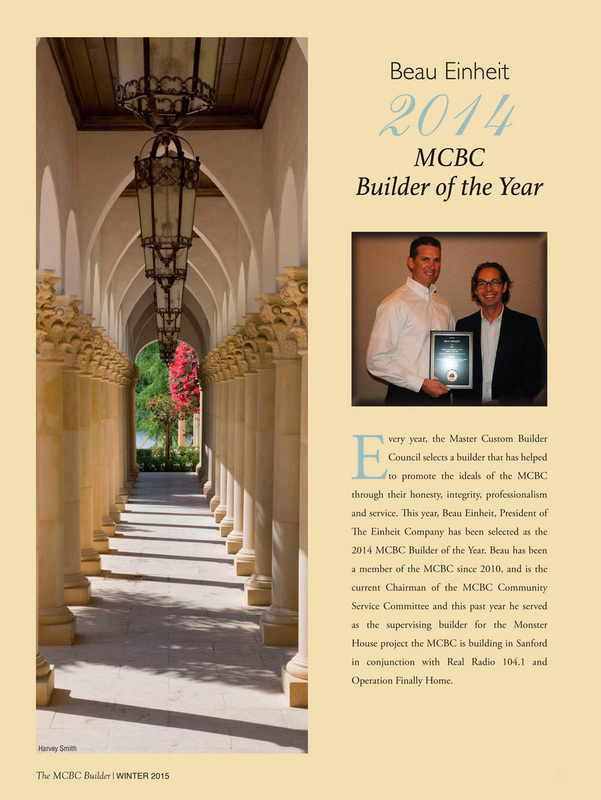 Beau Einheit received the 2014 Builder of the Year Award from MCBC. 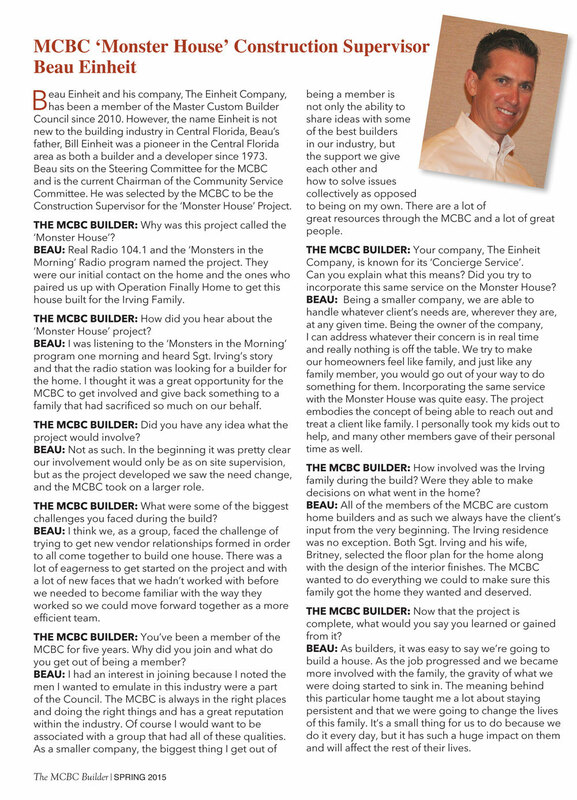 The MCBC Builder featured an interview with Beau Einheit in its spring 2015 issue.